The first talk of the day was given by Dr. Sarbani Basu (Yale University), who was awarded the George Ellery Hale Prize for “outstanding contributions to the field of solar astronomy.” Dr. Basu is an expert in helioseismology — the study of tremors and vibrations of the Sun. While stars in certain mass ranges undergo huge, regular oscillations (so-called variable stars, like Cepheid or RR Lyrae variables), Sun-like stars experience smaller-amplitude pulsations generated at the top of their convective zones. These subtle pulsations hold the key to understanding the interior structure of the Sun and other stars — a problem that renowned astronomer Arthur Eddington thought would never be solved, commenting that although telescopes enable us to peer at more and more distant stars, no instrument could help us look into the interiors of stars. Luckily, that’s not the case! The Sun oscillates in millions of different modes, which we can tease apart using helioseismology. Helioseismology can help us determine the true metallicity of the Sun (a long-standing problem that has huge implications for virtually all of astronomy! ), how the solar interior rotates, and the degree of diffusion and settling of different elements within the Sun. One of the huge triumphs of helioseismology came in the midst of the solar neutrino controversy — the realization that the number of solar neutrinos received by Earth-based neutrino detectors was too small by a factor of three. By using the absurdly good helioseismology data (Dr. Basu showed a plot of data where the 1,000-sigma error bars were smaller than the plotting symbols! ), solar physicists showed that their models of the solar interior were right and the error must lie in the standard model. As it turns out, they were absolutely right — neutrinos, which were initially thought to be massless, instead possessed a tiny amount of mass, which allowed them to oscillate into any of three “flavors” (only one of which was easily detectable) as they traveled from the Sun to the detector. 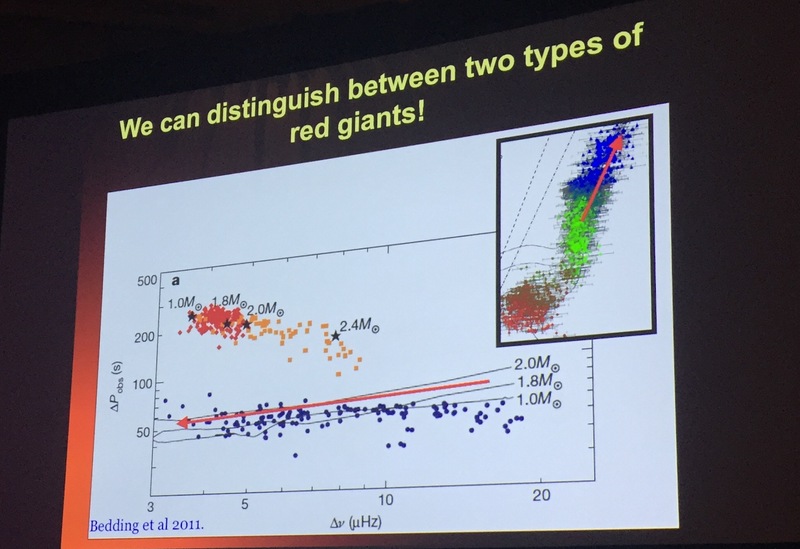 Different types of red giants fall in distinct areas of parameter space. Another win for asteroseismology! In the case of stars outside our solar system, asteroseismology can help us infer the fundamental properties of stars, since the maximum frequency of stellar oscillations scales with the stellar mass and the square root of the temperature. 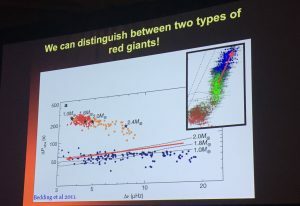 Also very exciting is the potential to distinguish between red giant branch and red clump stars — two types of stars that fall in the same area of the HR diagram but represent different stages of stellar evolution. Although they have similar temperatures and luminosities, their internal structure is different — and we can probe that structure with asteroseismology. Expect big discoveries from this field in the future! For this morning’s press conference, Kerry Hensley began the proceedings, supported by AAS media officer, Rick Feinberg, and Gourav Khullar. 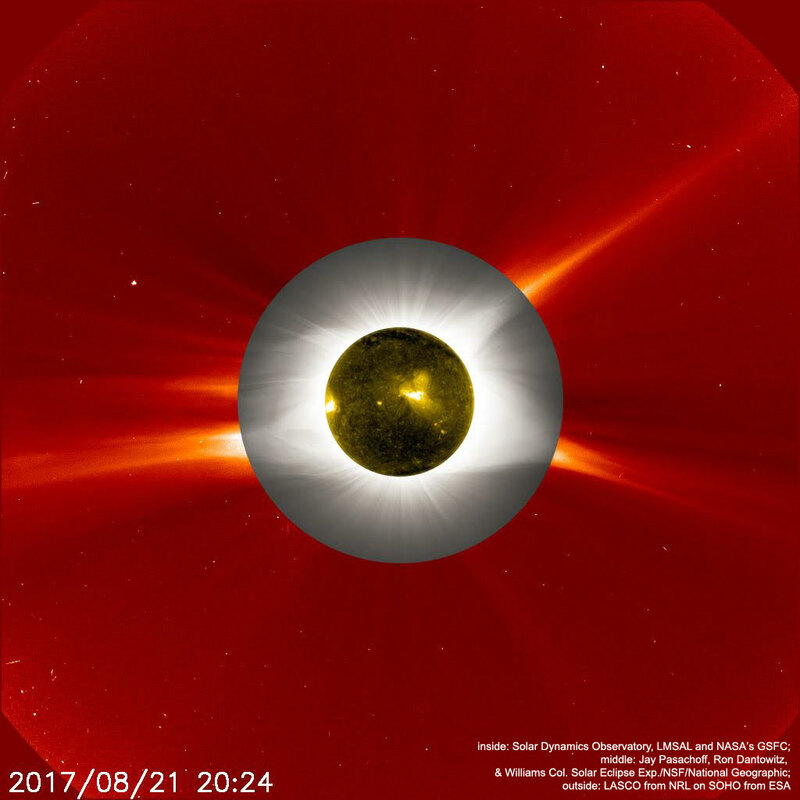 The conference opened with Jay Pasachoff (Williams College & Carnegie-Hopkins Observatories), who discussed observations of the solar corona during the 2017 total solar eclipse. Salem, Oregon was the observing site for the project, where Pasachoff and collaborators constructed composite images of the eclipse to highlight the corona. Coronal streamers were also studied, along with polar plumes. Pasachoff also showed some observations from the International Space Station, clearly exhibiting a shadow of totality! This was a great opportunity to study active regions in the Sun, especially from composites from multiple sites around the US. Pasachoff ended with a pitch about future total and annular eclipses across the US in the next 5 years. This was followed by Thomas Ayres (University of Colorado Boulder), who described his project characterizing the habitability of planets around our nearest interstellar neighbour, the Alpha Centauri star system. Two of the stars have Sun-like environments, but Alpha Cen C is what Ayres likes to call a ‘weather hell’, due to its extreme X-ray flux capable of stripping away atmospheres and frying unprotected life. Ayres and collaborators used the Chandra X-ray Observatory to track the X-ray emission from the Alpha Cen system over the past 13 years. Chandra observations are the only ones capable of resolving stars A and B — B is seen to have stronger X-ray flux than A. According to Ayres, it so happens that Alpha Cen A is great for potential habitability prospects (its X-ray hazard is much lower than that of the Sun). Cen B is not too bad either, whereas Cen C is literal death! Sofia Moschou (Harvard-Smithsonian Center for Astrophysics) was to follow, with her work on studying coronal mass ejections (CMEs) in the star Algol. Moschou’s recent paper in The Astrophysical Journal described indirect observations of monstrous CMEs in Algol. This work also characterized Algol’s place on the well-known proportionality between CMEs and flare intensities in the Sun (known as the solar CME–flare relation). The objective here, according to Moschou, is to see whether the proportionality of strength of the flares with CME activity continue with more active stars like Algol. The answer? It probably does. Stellar CME observations via Doppler shift measurements and X-ray absorption characterization enabled Moschou and collaborators to demonstrate Algol’s properties in the context of the relation, within the bounds of systematic uncertainties in observations of the Sun and Algol. The final presentation of the press conference was by Andrea Kunder (Saint Martin’s University), talking about dissolving globular-cluster stars! Globular clusters are the oldest stars in a galaxy, akin to fossils. Kunder and collaborators are interested in seeing the interplay of globular clusters and the Milky Way bulge, especially since the bulge is the site of exciting activities! Kunder studied NGC 6441, the 5th most massive cluster in the Milky Way, which lies in a crowded bulge field with many field stars, and affected by massive amounts of gas and dust. This study used RR Lyrae stars as distance and velocity indicators on a velocity-radius diagram to isolate stars in the globular cluster from RR Lyrae stars outside the cluster. Kunder showed the results, which remarkably point to the idea that there are groups of RR Lyrae stars on the outskirts of the current form of NGC 6441, and the trajectory of the cluster indicates that these are ex-cluster members. In other words, stars in this globular cluster are dissolving away as we write this! The properties of an AGN are intimately linked with the properties of its host galaxy; the SMBH mass is correlated with the galaxy’s halo mass, and its accretion rate is proportional to the star formation rate of the galaxy. These black holes are truly behemoths, with masses equivalent to millions or billions of suns — but they’re not that big compared to their host galaxies. Yet SMBHs still manage to influence their galaxies on such large scales. As Comerford noted, the scale difference between a galaxy and its SMBH is equivalent to the difference between a grain of rice and the size of the Earth! Comerford’s talk focused on two major ways that AGN can influence their host galaxy: fueling (the SMBH accretes matter) and feedback (the SMBH launches energetic jets and outflows, which can help turn off star formation in a galaxy). If you want to read more about these, check out my interview with Julie Comerford here! Both fueling and feedback can be traced using pairs of supermassive black holes. These pairs can either be observed as dual AGN, in which both SMBHs are active, or offset AGN, in which one SMBH is quiescent so the active one looks off-center. How do we actually find these dual and offset AGN? As Comerford explained, we can search for galaxies with narrow emission lines that have two peaks. These double peaks can be caused either by dual AGN, by disk rotation, or by AGN outflows; spectroscopy and images from radio and X-ray data can then be used to identify the dual AGN. We can also look for offset AGN by carefully comparing the positions of SMBHs (in X-ray images) and galactic centers (in optical images). Where in a galaxy merger does AGN fueling occur? The fraction of AGN increases as the two SMBHs get closer together, and new observations show that the AGN fraction is highest in the inner ~1 kpc. Can outflows from moderate luminosity AGN contribute to feedback? The most powerful outflows seem to be driven by the most luminous AGN, But it turns out that about 90% of moderate-luminosity AGN outflows that have double-peaked narrow emission lines do have enough energy to turn off star formation in the galaxy! Finally, Comerford talked about ways to connect fueling and feeding. Her group recently discovered a dual AGN that showed two discrete accretion events — a flickering AGN! Each event caused an outflow event, leading to a signature of asymmetric outflows. In the future, integral field spectroscopy on other interesting systems like this will help us further our understanding of these hungry galaxies. This afternoon’s press conference explored distant, active galaxies — and also a quieter galaxy much closer to home: our own Milky Way. William Reach (SOFIA/Universities Space Research Association) opened the conference by presenting work exploring where cosmic rays — highly energetic particles — originate and how they’re accelerated to their incredible speeds. Recent research has localized the source of some energetic cosmic rays and suggested that they may be originating in interactions between supernovae and molecular clouds. At these interaction sites, dense shocks occur, which can accelerate particles to their high speeds. Next up, Randall Campbell (W. M. Keck Observatory) & Anna Ciurlo (University of California, Los Angeles) tag-teamed a presentation on Keck observations of the galactic center over the past 12 years. The center of the Milky Way hosts a supermassive black hole, Sgr A* — and we can learn a lot by watching close-in objects orbit around it! In particular, Campbell and Ciurlo have tracked several G-objects — objects in the same class as the exciting G2 that passed close to Sgr A* in 2014. Observations of these objects suggest that they are likely puffed-up stars shrouded by their thick outer layers of dust and gas. They may have originated from binary mergers, and it’s possible that they’re the progenitors of future S-stars: young, bright and very massive stars. The final talk of the day was an update on the status of the Daniel K. Inouye Solar Telescope (DKIST) given by Dr. Valentin Martínez Pillet (National Solar Observatory; NSO). DKIST is a 4-meter solar telescope currently under construction at Haleakala Observatory on the island of Maui in Hawai’i. After 8.5 years, DKIST (formerly known as the Advanced Technology Solar Telescope) is 83% complete, with first light planned for 2019 and the beginning of science operations following in 2020. DKIST aims to answer persistent questions about the Sun — in particular understanding the physical driver for coronal mass ejections. The 4-meter aperture translates to a resolution of 25 kilometers and a signal-to-noise ratio of 10,000 — so it’s no surprise that Dr. Martínez Pillet called it “a microscope on the Sun”! DKIST promises to transform solar physics with its multiwavelength (0.38 – 28 microns) observing capabilities, coronagraph, and polarimetry. Some of the most exciting possibilities for DKIST involve the potential to combine its observations with those from Parker Solar Probe (which will fly to within 9 solar radii of the Sun’s surface and make detailed measurements of plasma properties there), Solar Orbiter (which will orbit the Sun at about the distance of Mercury’s orbit and carry both plasma instruments and a telescope), and the Atacama Large Millimeter/submillimeter Array (ALMA; a ground-based radio telescope array). This signals the beginning of a true multimessenger era for solar physics — get excited for first light in 2019! The final plenary session of AAS232 is upon us, and what better to talk about than one of the greatest set of observations taken this century — the Gaia Data Release 2 (DR2)! Nicholas Walton (University of Cambridge, and Gaia), began by crediting the European Space Agency, the Gaia Collaboration, the Data Processing and Analysis Consortium (DPAC), and the massive efforts put in by industry and member universities of the collaboration. Read more about Nick Walton here! This talk was both an overview of the Gaia mission and a brief description of science currently being done with this ginormous new dataset released a month ago! Gaia was launched in December 2013 and traveled all the way up to the 2nd Lagrangian point (L2 orbit) between the Earth and the Moon. Its first data release occurred in September 2016, and DR2 came out last month — with 1.7 billion objects in the catalog, recording photometry, spectrometry, and astrometry. This dataset is being used to characterize dust in the Milky Way, as well as the luminosity, proper motion, position, color, and surface temperature of stars around us! Gaia maps the sky with a 1-arcsecond resolution, showing the Large and Small Magellanic Clouds, and the Sagittarius stellar stream in all their glory! The talk described the Gaia focal plane (106 CCDs, a billion pixels! ), data-processing effort (pan-European, 450 specialists in 24 countries! ), and DR1, which did not utilize the entire processing flow that allowed DR2 to obtain its microarcsecond-level astrometry, milli-magnitude level photometry, and 1 km/s-level radial velocities. This blows my mind! Read more Astrobites coverage of this mission here. This was followed by a discussion of the completeness and sky coverage of the mission, which is significantly better for nearby astrophysical objects than ground-based surveys. While the astrophysical parameters (which we call second-order parameters here, derived from primary observations) need to be interpreted with care, Walton (and we at Astrobites!) would urge you to check out all the 70 arXiv papers in the last month or so based on DR2. These papers characterize the Milky Way disk kinematics, discover new stellar streams, construct magnificent HR diagrams for 4 billion stars, survey asteroids in the solar system, measure dynamics of globular clusters in the Milky Way, and so much more! Walton also cautioned the audience to treat DR2 and DR1 as independent datasets, since the systematics are different, as well as the photometric processing pipeline. The future is bright, since Gaia is scheduled to make extended observations over the next five years, and release datasets beyond DR4 (Data Release 4)! Accessing DR2 data is as easy as googling the Gaia Collaboration website, which lets you parse any sub-dataset with ease. Log on and get to science, people!